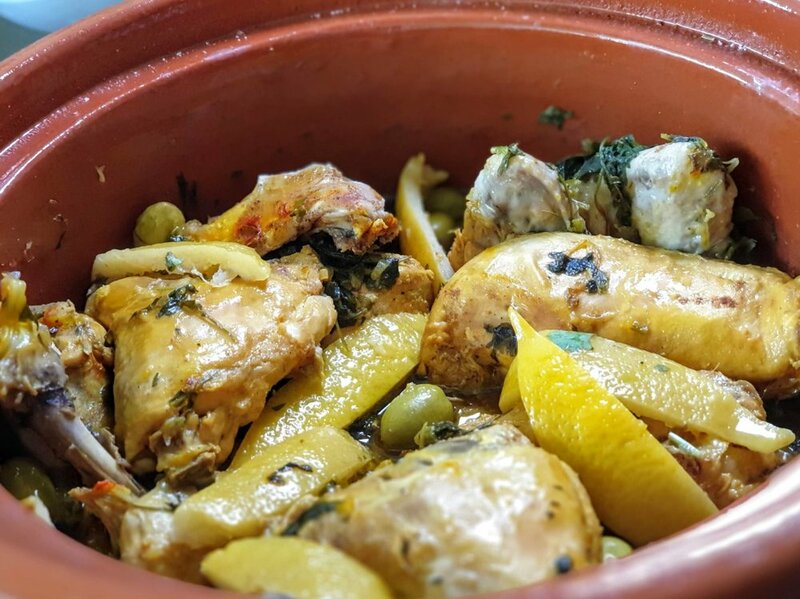 I love cooking in clay pots, not only because food does not burn but because the heat and moister is trapped and circulates making meats softer, juicier and flavoursome due to the slow cooking, have a look at my terracotta spiced lamb recipe. This dish is indeed an example of hassle-free cooking, just layered ingredients in a natural earth ware pot and left to its own devices to cook. The secret to the intense yet tantalising flavour lays in the balance between the spices and the acidity, but again I encourage people to add or change ingredients to their liking. This dish was a hit at my deli in London and remains a hit at my dinner parties. Preserved lemons are easy to make and are versatile in the kitchen in both savoury or sweet dishes. When you are in a pickle with time and running against the clock think of this recipe, the family will thank you. * Cut the chicken into 8 parts and set aside. * In a small bowl add around 1 cup of warm water then mix in the saffron, paprika, black pepper and the cumin. Mix and set aside. * Separate the pulp of the preserved lemon from the skin and chop it, then slice the peel into 8 wedges and set aside. * Place a heat diffuser on the stove top then place the tagine, terra-cotta pot or a regular pot and heat the olive oil then add onions, garlic, ginger and sauté for 1 minute until the aroma fills the kitchen. * Add the cinnamon stick and sauté for a further 15 seconds or so. * At this point add the chicken to sautéed onions then top it with the spiced warm water, preserved lemon pulp and season with salt to taste. * Chop what amounts to 1 cup of parsley and one cup of coriander and add the herbs to the pot. Cover and leave on low heat for 1 – 1.30 hours or until the chicken is cooked. Remember to check regularly as the sauce should be reduced to a thick consistency. * Towards the end adjust the seasoning and add the olives and lemon peel to the tagine and let it simmer for a few more minutes. * For best results marinade the chicken in a mix of the spices, water, preserved lemon and herbs for a minimum of 4 hours. * You can cook the chicken with skin on if you prefer. * Cooking bone-in chicken adds a rich flavour but if you are in a hurry use boneless chicken as it takes less time but remember to use warm chicken stock instead of warm water. * For an extra acidy flavour add the juice of half a lemon. Per Serving: 462 Calories; 34g Fat (65.4% calories from fat); 27g Protein; 14g Carbohydrate; 4g Dietary Fiber; 152mg Cholesterol; 659mg Sodium.